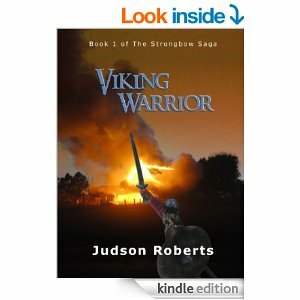 I recently discovered a new historical fiction series named the Strongbow Saga by Judson Roberts. The first book in the series is named, Viking Warrior . The Amazon.com Website describes the saga as, “an epic tale of one man’s unstoppable quest for justice and vengeance that carries him across the 9th century world of the Vikings”. It is the story of “Halfdan, the son of an Irish noblewoman and the Danish chieftain who captured and enslaved her.” Halfdan “has grown up a slave in his own father’s household.” As the story progresses we see Halfdan gain his freedom, receive status in the family, only to lose them after they are betrayed by his step brother, Toke. The book ends with Halfdan making his escape and taking a vow to avenge the death of his half-brother, Harald. 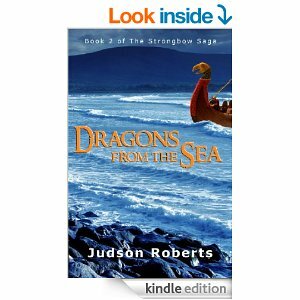 Dragons from the Sea and the The Road to Vengeance follows Halfdan as he joins the crew of a Danish longship to “make his fortune” and find a way to keep his oath of vengeance. As a member of the crew Halfdan takes part in the Siege of Paris in 845AD. Towards the end of The Road to Vengence Halfdan manages to get kill one of the men involved in his brothers killing. This is just one of many crew members he has vowed to kill, so he has a long way to go. He still has to face the captain, his step brother, Toke, addition to many other crew members. This tells me there are more books on the way! The fact that Mr. Roberts uses words and term from the Danish language and that he has a glossary in the book tells me he made efforts use accurate historical information in the story. Visit the Links page on the Judson Roberts Website for lots of great resources about the 9th century and Danish culture.